First up is the reigning new champion, Nick Powell. The master of trivia took down the prior five-time champ (um, me) last time, and is now challenged by his podcast co-host The Vern, as well as his longtime trivia nemesis Kristen. Can he make it a repeat, or will his stay at the top be short-lived? 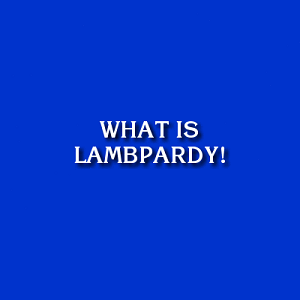 LAMBpardy episopdes are a semi-regular feature of the LAMBcast, so if you’d like to be a player in the future, keep an eye out over at the Forums, as demand is high and there’s a max of three contestants per show (and one of them is the returning champ). Congrats to this week’s winner, who was able to separate the “animals from the animals”. Fun show once again! I was not on my game that episode but it was still fun to compete. Well done on my questions guys, sorry if some of the meta ones were a little difficult! Great job on the different actor, same character ones.